Earlier this week, I saw something that made me very happy. One of the younger girls was outdoors wearing a coat she had put on by herself. I knew she had put it on by herself because it was upside down. 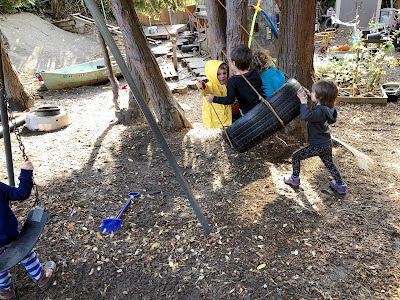 Being a cooperative, we tend to have lots of parents around the place, and it's an easy thing to fall back on our habits of "helping" children whether they need it or not. Our style of schooling tends to attract naturally helpful types to begin with and with so many of us around it's hard to not jump in when we see children struggling with things like dressing themselves, using the toilet, pouring water, or engaging in conflict. When we ask parents about their goals for their children at the beginning of the year, many, if not most, list "learning to be more independent" as one of them. It's hard to learn to be independent, however, without opportunities to practice being independent, so I ask the parents to remember that it's not about efficiency in preschool and urge them to step back and allow the struggle; to avoid jumping in at the first sign of a conflict, but rather to give the children the time and space to see if they can solve it themselves; to accept a few spills and missed toilets and upside down jackets as part of the process of learning to become an independent human. At the same time, we also want our kids to learn to work well with others, to get along with the other kids, to form a community, to become more interdependent. And that too, is something we all need to practice. This is why we make our own rules together, coming to agreements about how we want to treat one another. This is why we try to leave most of the tidying up to the children. This is why when a child asks for help, say with working a puzzle or untangling a knot or when they want someone to push them on the swing, I ask the parents to fight the instinct to be the helper. Much better is to simply call out to the crowded classroom or playground, "Sally needs help with this puzzle," or "Carl wants someone to push him on the swing." Young children are naturally helpful types as well. Invariably, one of them, often many of them, will offer their services. Independence and interdependence are our goals: the traits of good citizens in a democratic society.